NOTE: While I love all comments on this post, I want to make sure you understand that the Hero Arts giveaway is on THIS OTHER post. Thanks! I've lived in or near Washington DC most of my life, and I swear it's getting wackier and wackier around here. Our subway system is in a meltdown and then politics! Regardless of the wackiness that is DC, if you've never been to DC and have a chance to do so, I encourage you to visit and take advantage of all the free things to see and do. It is a fantastic place to see history plus there are a ton of fun things to do, particularly for kids. Warning, summers are hot and sticky, but there is so much to be proud of and just plain enjoy. Ok, tourism pitch over! Carefully painted the stamped image with plain water -- just enough to give a slightly watery look. Decided not to watercolor a background around the image because the chances I'd screw it up were approximately 100%. Added a few crystal Stickles. Popped up the watercolor panel on foam tape. The background is Hero Arts Confetti Bold Prints, stamped in Versamark on a deconstructed Paper Source envelope. Used the same stamp to decorate the envelope liner (Versamark on typing paper). Great watercoloring, Joan! I also wish I had you for a tour guide when we through DC a couple years ago! Fun card! I agree that everyone should visit DC at least once if not more. So many things to see & most of it is free. My ex lives near there & my son spent many summers visiting. Unfortunately, his family rarely went into DC. After he was old enough he decided to take the metro and see things for himself! I have been several times & hope to be back again. Have a great week - hope your arm is better. What a fun card, this is awesome!! 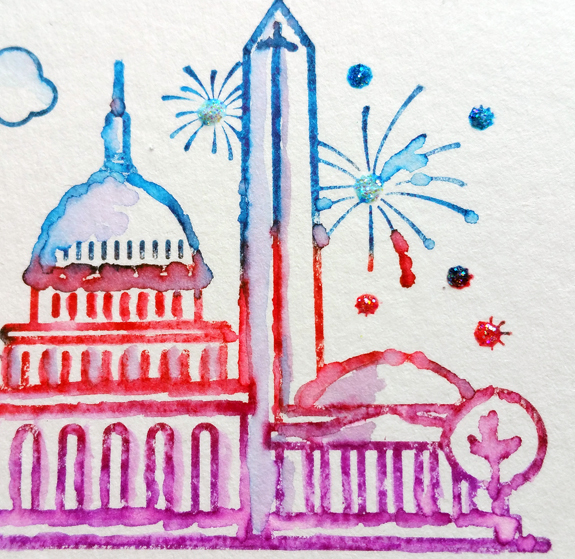 LOVE how you used the markers to color the Destination stamp...what a fun card! Very cool, thanks for the detail shot! 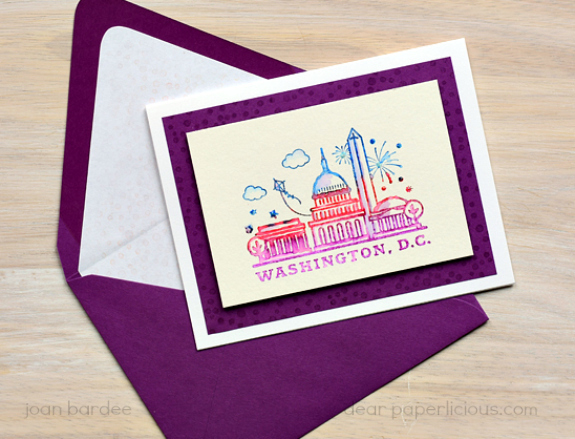 Great card and love your red-blue-purple colors! This looks great, especially in the close up. Love the way you colored it. I really love the painterly look you achieved on this plus the multi colored image! Very fun Joan! I was in DC back in 1992 or 1993. I do remember the heat and humidity! It was palpable. I really enjoyed my visit to DC, I think we only spent a couple days exploring around. I'd love to visit again one day. Love your cards, love the products! Thank you.